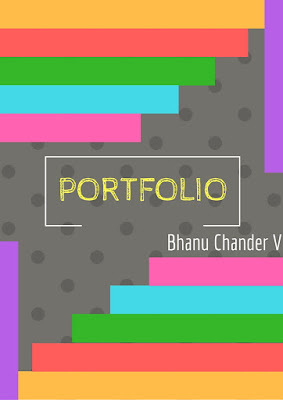 Good to be back after a long time, this time with the most desired topic - PORTFOLIO making. In my previous post on Tips on design portfolio making, I've shared written tips rather than working on actual designs, along with some online helpful folio links. In this post I've taken time to make some works and collect and group my previous works to give you a broad idea. 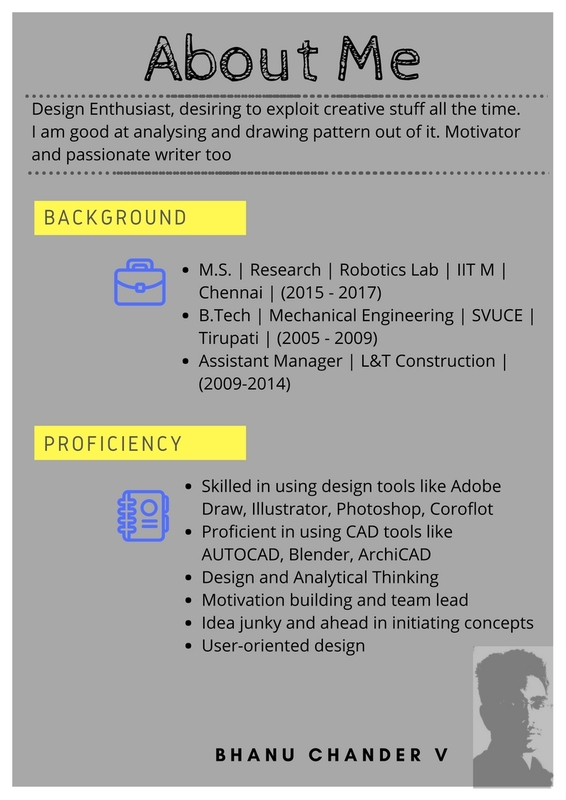 While I'm seriously not a designer or an expert in sketching, I tried to make something to give you some idea of how the portfolio could be handled and what Softwares, designs, layout could be used in yours. For now, I'm just sharing the works that I made as part of portfolio in digital forms. I'm planning to make a clear video of how the portfolio that I designed looks like and how I constructed that, including the tools and media used. I also want you to try a free online software for making stunning digital representation, just like I used for my portfolio. I will be giving a quick video guide on how to work on that online design tool. You might find it very helpful for your portfolio making. I've chosen to show portfolio in A4 format with some creative idea of opening papers or viewing the details in it. I will show how my portfolio went in a video soon. You can opt A3 also. Followed by each image below, I have given some tips and observations which would help you. Please go through the tips for sure - for your benefit. I tried to cover PD, Logo, Poster, User Interface, Industrial designs in my portfolio, just as an example to help everyone applying for different streams. But, if you are applying to one or two specific streams, then include (to the max extent) your creative works or designs related to your selected stream - like say out of 15, make at least 10 related to yours, while the rest can include, sketches, other stream designs etc. Let's start looking at my Portfolio! I considered making my portfolio in a book/binded form. So, I've used Front and back cover pages. My first page is cover page which states my name and what the content is. I initially planned to get color papers, cut and organise them creatively for my front cover, as the saying goes first impression is the best impressions. This will turn out to be positive especially for NID. But since I'm time bounded, I used online design tool called Canva (I will explain how to make one in a video) to make the above front cover which took me less than 10 minutes! But, note that simple white front will do the job and if you plan to go with plain front, just go ahead. 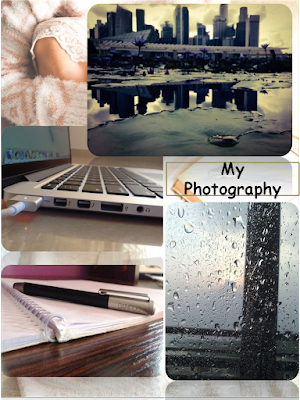 My second page is "About Me" section, briefing about my profile. I was sceptical including this as I doubt whether it is good to include just for mdes interview (but it's kind of mandatory for real design interviews and so keep it a good practice). You might also consider pushing the about me section at the end if any of your seniors have told you not to include them in your folio! Trust me making these digital representations are damn easy! Your core competency (Proficiency), the things you are good at! As far as possible keep it simple and less words, use short but powerful synonyms instead of writing a whole story! After the brief intro about me, I switched to the actual business of showing my design skills. 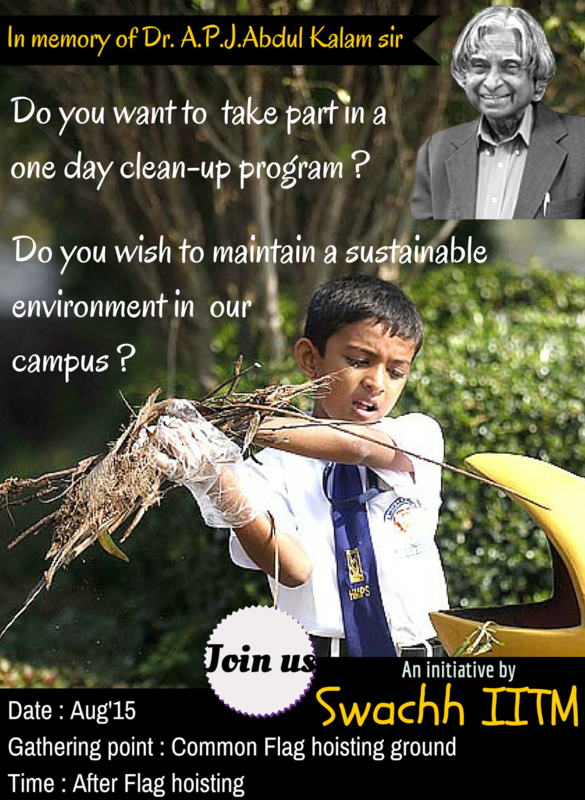 Swachh Bharat IIT Madras chapter had decided to organise a cleaning campaign on 15th Aug, on the eve of independence day and to remember the social works of the recent demise of Dr. APJ Abdul Kalam Sir. 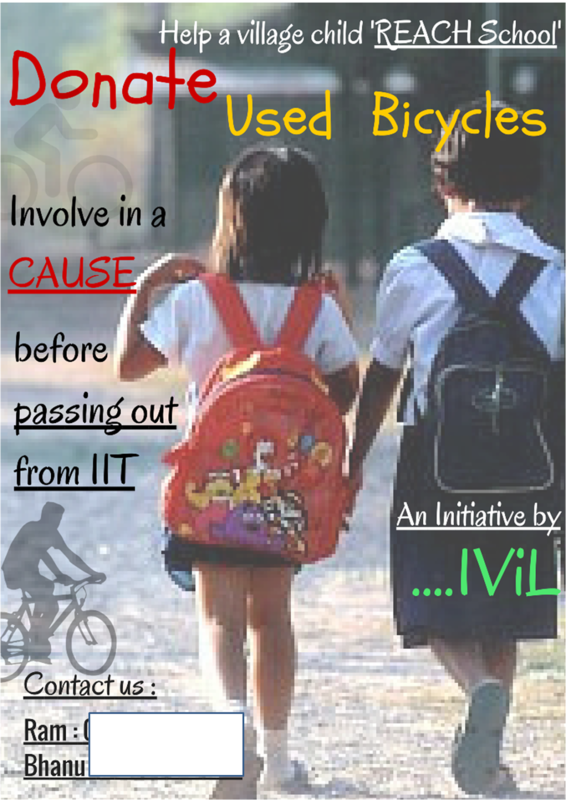 Desing a Poster for inviting students and residents at IIT Madras, to participate in a one-day Swachh bharat cleaning campaign to bring awareness to them about maintaining cleanliness in the campus. Technology is growing every minute, ranging from wearable technology like Virtual Reality headsets to Driverless cars. Although the growth is exponential, still in rural parts of India, many rural people are unaware of how to operate even a basic mobile phone. Forget about the apps available for them. IViL - IIT for Villages, a social group in IIT Madras, came up with the idea of making a book that lists out the available apps for android based smartphones related to farming, productivity, chemical usage and more that would help them be productive and earn more. Phones are available but making them aware; are more important. So, the problem given to me is to design a back cover that catches the sense of incorporating technology for farming and the need of using apps for productivity issues. 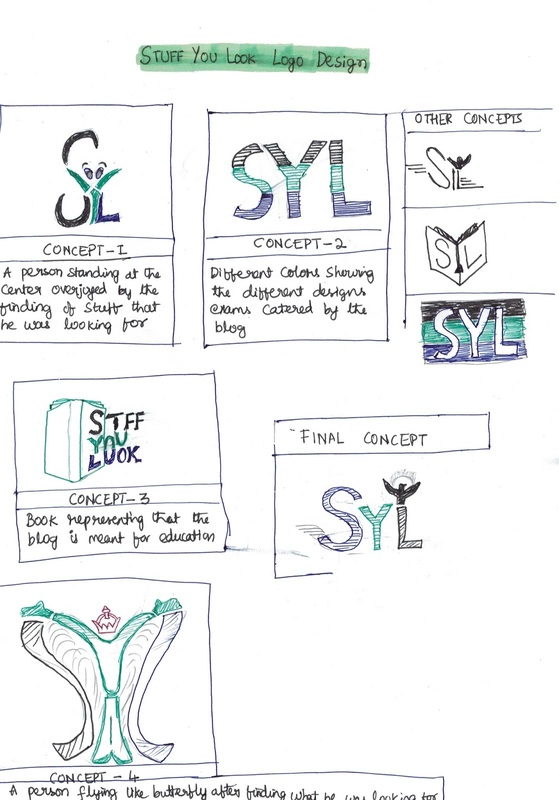 Better to show some concepts in their final state rather than showing the ideating/brainstorming process that we usually do while logo making. I've shown some funny rectangle enclosing boxes. You can avoid them, and use plain page. Better to keep all the font in CAPITAL letters! I've only three color pens and one pencil when I was making this (Poor guy you know :P) So, I used only them. For logo's you better use colors to make it visually pleasing. An automation industry needs an adjustable conveyor in a very little space. The conveyor is to be made such that it should be adjusted in length while during operation also, without being stopped off the ongoing work. The workspace is limited for additional manipulations or links to attach or extend. 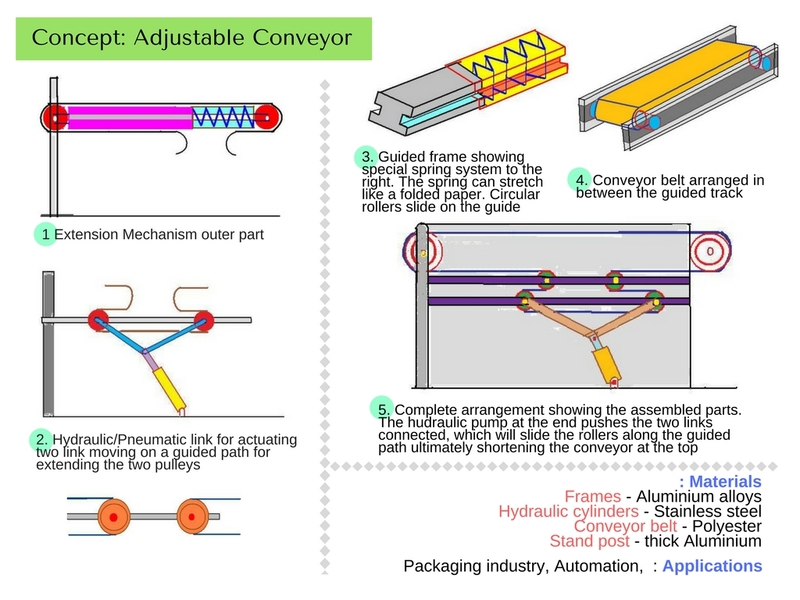 Design a flexible and adjustable conveyor for this industry use. Tools Used : MS Paint! I thought like using online tools as it will be more professional and clear. But, I don't want to try new software at this point, so convinced with pen work! 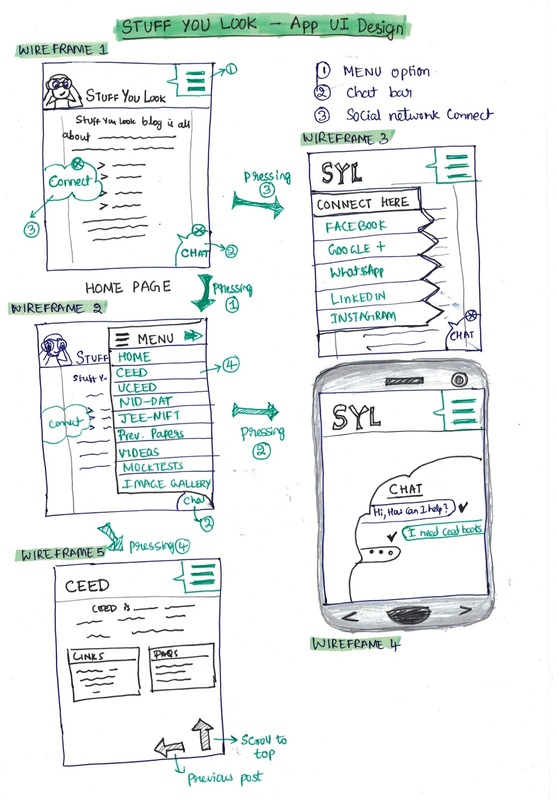 For UI design wireframes, better to have minimum color variations while pencil/pen sketching. I made this work very roughly and I didn't give a thought to get the good idea, Whatever struck my mind I just drew them as I was running out of time!. 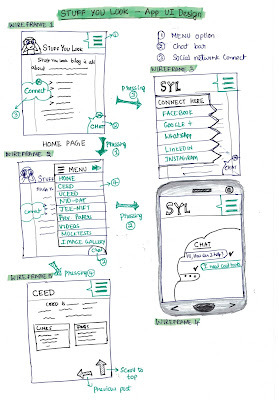 Product Designs should be shown very well and should clearly explain what features the product could deliver to the users, it's uniqueness, with very clean and neat sketches. Your work should show some concepts (not less than three) with a final neat design showing all the parts, preferably in different views and/or with exploded view! 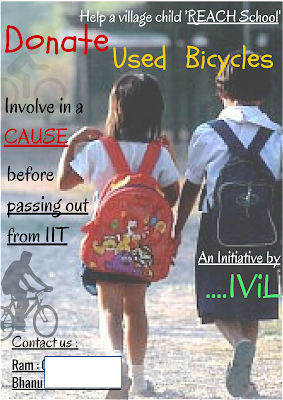 As part of IViL - IIT for Villages, a social group for helping villagers, a cycle donation campaign has been organised. 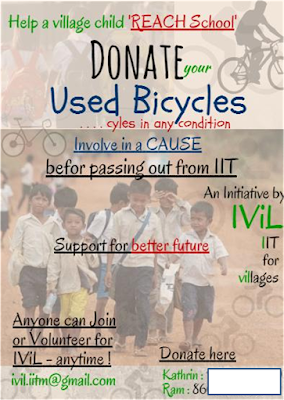 The basic idea of our team was to collect used cycles from the graduands and donate that to the needy students in the villages whom usually travel several kilometres (10-15 km) every day to school. 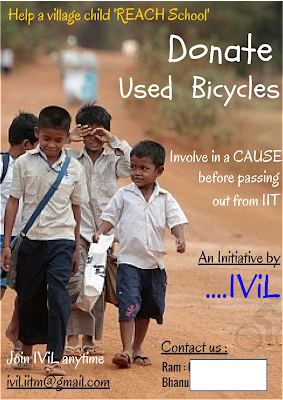 Indian statistics says that many children drop schools just because they cannot walk. 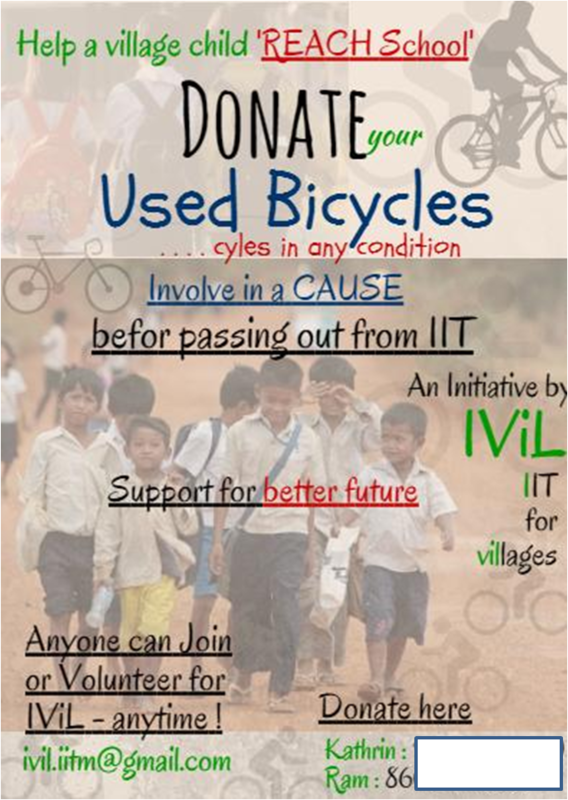 So, design a poster to attract the graduands and motivate them to donate their cycles for the social cause. 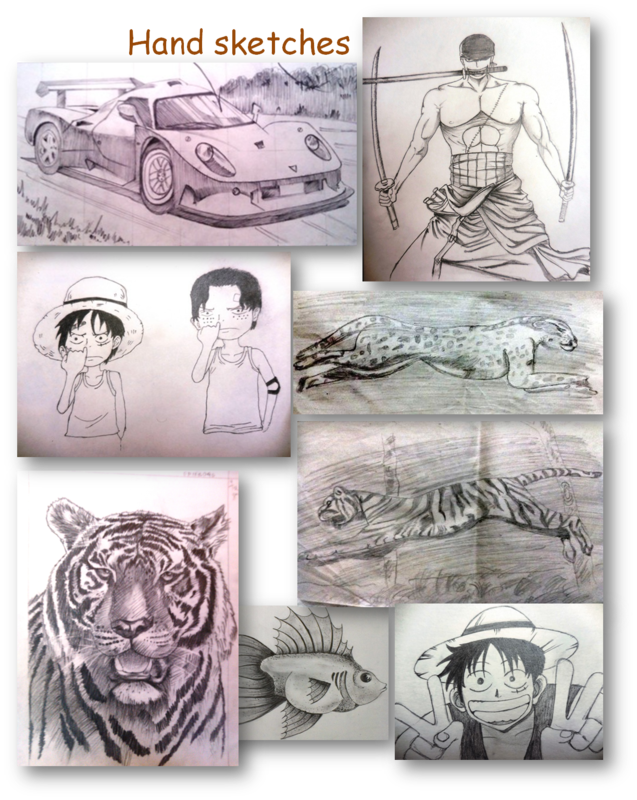 I considered showing my (for now consider these as my works) sketches in one page, showing the best sketches that I've done till date, which includes object sketchings, creative/perspective sketching, still life figures, cars, portraits etc to show my sketch skills to the interviewers. If you've worked with tools and software, then consider showing some or best of your works in the folio. 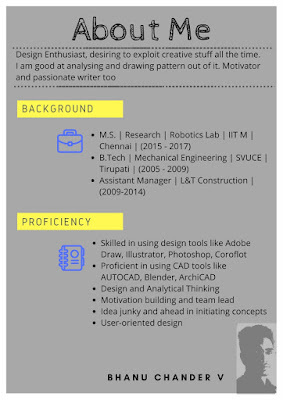 These days, designers are required to have hands-on experience with digital tools and if you already have them, then you might have upper hand in the interview by showing your works. Note that I've shown self-portrait of mine, as I don't have much of them, although I've worked on Gods etc. But since it's an interview, it's better not to show religious related works like gods etc, just not to get rejected, as the possibility of interviewer getting offended are there, even if it's very few percent! I don't had time and so I did many of the works very roughly or didn't cared for Font styles, borders, alignment etc. You should keep these things in mind and make sure that your representation is neat with care being taken. 1. Applying to IISc ? 2. Applying to NID ? 3. Applying through CEED ? You may/may-not Include photographs or DIY/creative works, if you don't have them. 4. Applying to private institutes? (and numerous) - don't try these many, just try one or two and make yourself good in that. That's it for now, I will make a quick video guide on canva software later as my eyes are shutting and crows already started cawing. I will also try to make a video of how I grouped my portfolio. Again, All the above are just my suggestions, and what I would have done if I were in your place. It need to be perfect. Thanks man, that will really help! 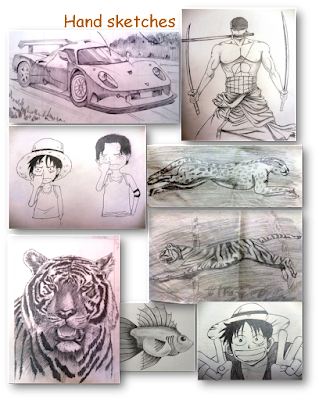 Is it preferable to make the portfolio in the A4 size(I know it looks good and compact) coz i had prepared A3 size portfolio all including my actual works. 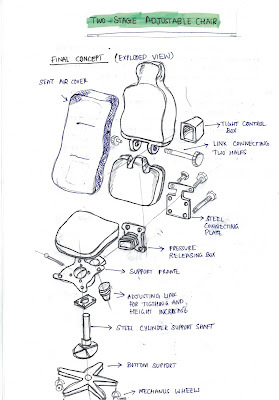 sir,i made also one A3 size paper sketchbook for transportation vehicle design sketches & rendering so, that can be called as one portfolio or not ?? I made one A3 size paper sketchbook for transportation vehicle sketch & rendering so, that can be called as one portfolio or not ?? 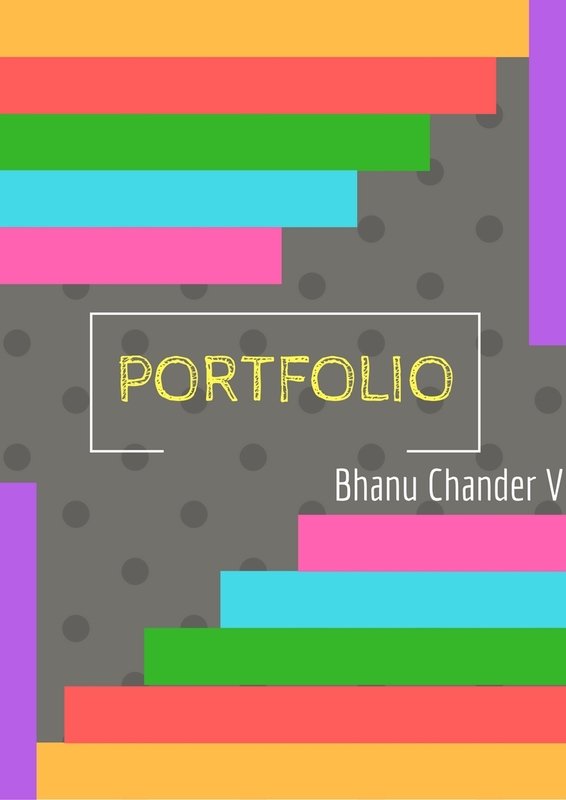 Thank you sir, it gave me idea about portfolio , i am having no idea about ,how to stard and what to make ,it would be great if u can upload 2 or more different way of presenting the idea of portfolio . 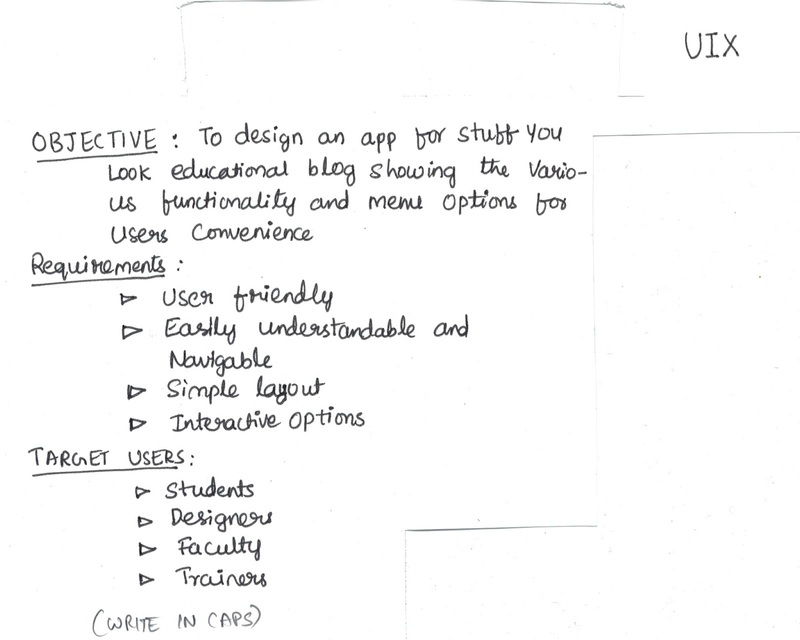 I wanted to inquire about what softwares to use for displaying different screeshots of some application for UI/UX. Please guide me for the same. I found "Moqups" to be convenient, apart from that you can try InVision, UX Pin, photoshop, InDesign, You can also try googling "best UI wireframe tools for UI design"
I want to know about private colleges like MIT what they actully want in portfolio and in the apttitude entrance exam. Fortunately, regarding portfolio for private institutes like MIT, you can show whatever creative design skills you've unlike for IIT's or NID. I don't mean here that NID or IIT's standards are far, but what i meant is they do accept to see variety of your talents, not just your hold on the design stream that you're applying. You can show things like creative DIY's, pics, mechanisms, design of various streams etc. 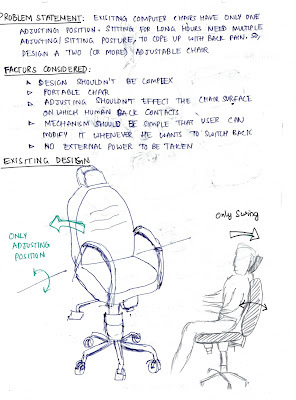 To put in one line - "Show whatever best works you've or you can do"
If your vision is within proper limits (able to see), and if u perform well in exam as well as do good at design ideas (thru portfolio-is one way), then u will have chances to get selected. Remember, there's a separate category for PH (Physically handicapped) students too! So, that does means that NID or nay institute accept PH or any other people, provided, they exhibit some level of skills which they have set the criteria as limit for them. I think u can give a try. I'm an NID UG applicant and I just shortlisted to the main exam. How important is it for me to have a good portfolio (Most of the people I reached out to had presented one). Also, please tell me what I should include in that case, because most of the above mentioned methods (I feel)are a little too far fetched for a UG applicant. Hello, thank you for the post. What should be the order of contents: best first or stream specific first ? The scenario could be like "your best works are your stream specific related" I mean showcase more talent in your works of chosen streams. Otherwise, If I'm in ur place, I would go for showing stream specific first, then others as it would answer the first and basic imp question of the interviewers "Why are you choosing this stream?" Thank you very much Sir! 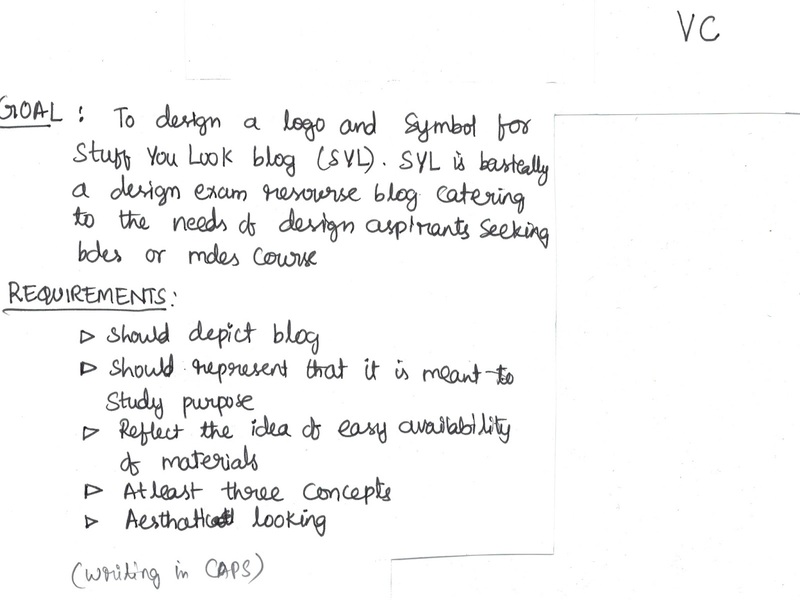 Until now I absolutely had know idea about what should my portfolio exactly contain...This is really very helpful. 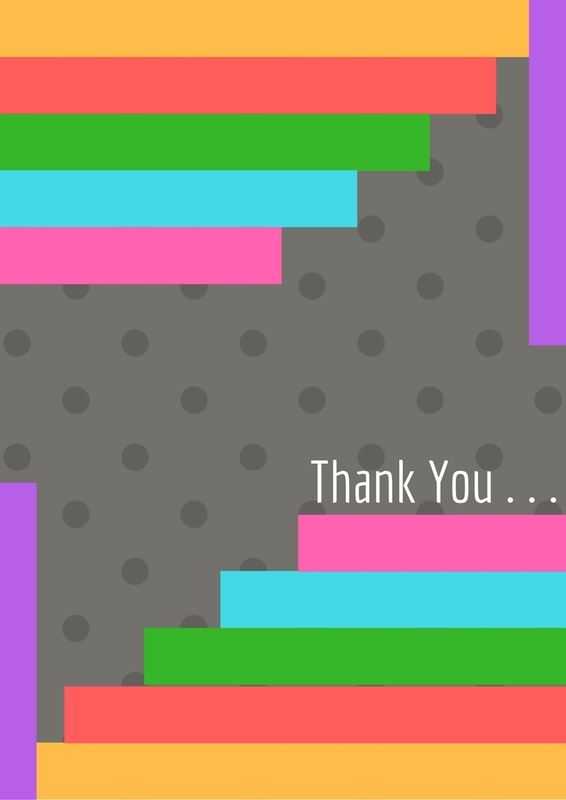 Thank you so much once again! Should product design portfolio for iits include just include sketches of innovative products or could also contain product sketches?If yes,then what should be the ratio of no of innovative product sketches to the product study sketches? if u have many innovative PD works, better show them all. 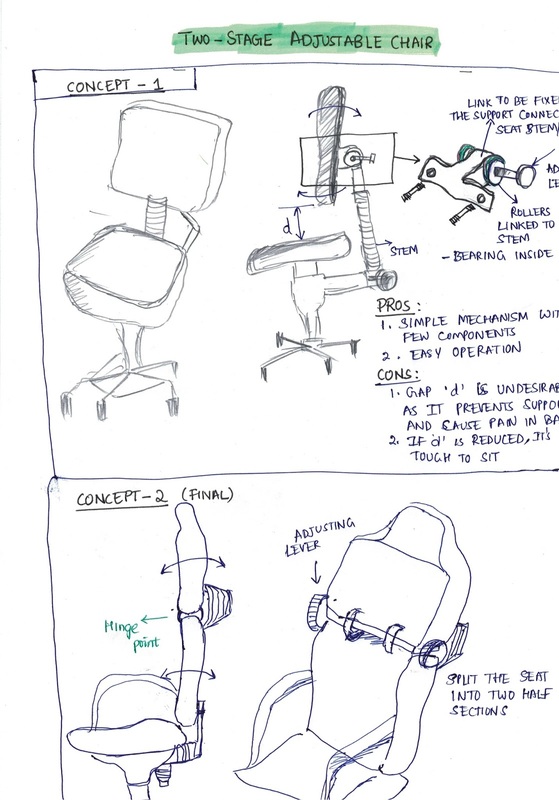 In any case, u can consider grouping of ur best product study sketches so taht u can fit in one or two pages out of 12-15 page portfolio. Just a suggestion! I thought that this post and the other (link available in this page) would give some idea about making ur own, didn't it helped ? or if u haven't gone thru the other post too, I would suggest you to go thru them. I think that should be enough! 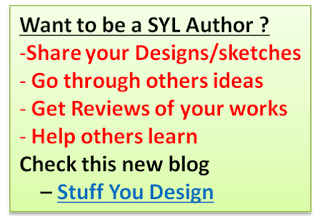 If u still couldn't find a way to make ur own, ping me on syl page or G+, I will try to give some suggestions. I like sketching from school days but I'm not so creative. I mean finding creative ideas to make a design takes time. 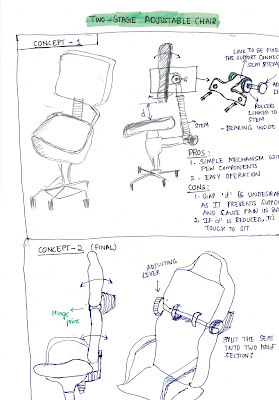 Finished my B.Tech in 2014 and there for the first time I came to know about the scope of design as a specific 'M.des'. Had I known for the career in design I would've never dropped my pencil after schools. Lately I'm applying for M.des at IITK. 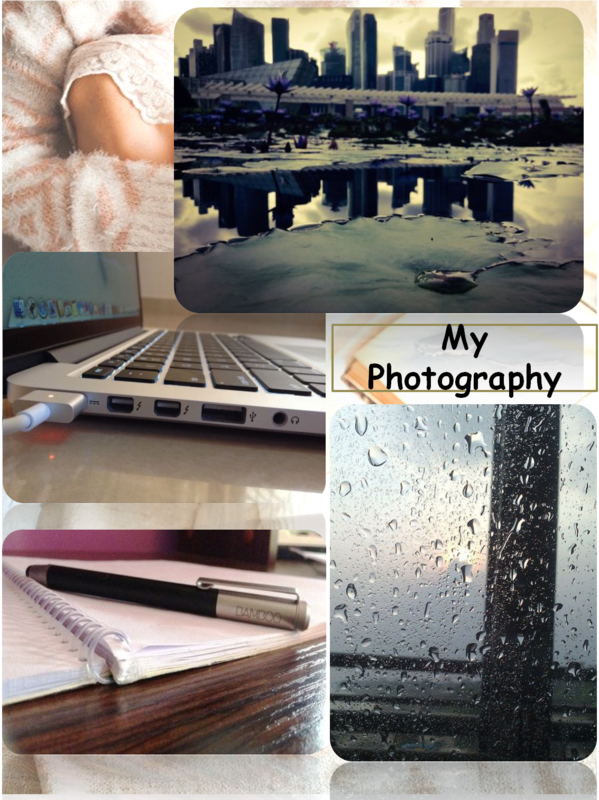 You have helped me alot with this blog but yet I'm not confident. Great blog. I wanted to know whether I need portfolio for bdes nid or is it only for mdes. I wanted a PDF format for Indian art and culture knowledge. Please refer if you know any. 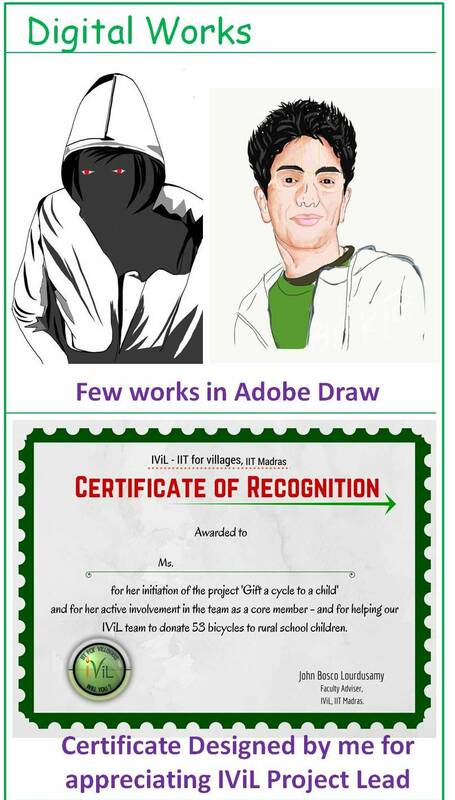 sir i am preparing for nid 2019 and my stream is graphic designing. so what all can I put in my portfolio? 1. Ur graphic art works done before as a project or hobby. the list is not exhaustive. 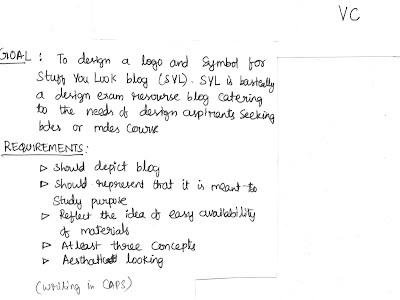 Just note that, u can include whatever is/are relevant to graphic designing.